In Part Six, I wrote about how the first recorded sighting of Anne Boleyn at the English Court was on the 1st March 1522, at the Château Vert Shrovetide pageant. Contrary to the scene in “The Tudors”, Henry VIII did not fall in love with Anne at this pageant, he was actually having an affair love with Anne’s sister, Mary Boleyn, at the time and Anne had returned to England to marry James Butler. In 1522 there was no spark between Henry and Anne, no meeting of eyes across a crowded room, and nobody had any idea that the girl who played Perseverance in the pageant would one day be Queen of England. So, what was Anne’s romantic background before Henry VIII? In the reign of Elizabeth I, Catholic recusant Nicholas Sander wrote of how Anne Boleyn was sent to Brie in France at the age of 15 after she had “sinned first with her father’s butler, and then with his chaplain”1. According to Sander, she was placed in the care of a French nobleman and then, when she later appeared at the French court, she became known as “the English Mare” and “the royal mule” because of “her shameless behaviour” and her loose morals. It is hard to take this claim seriously when we know that Anne Boleyn was sent to the court of Margaret of Austria in 1513 to finish her education and that she was then appointed, in 1514, as one of Mary Tudor’s ladies when Mary became Queen of France. When Mary returned to England in 1515, after the death of her husband Louis XII, Anne stayed to serve Queen Claude, wife of the new king, Francis I and there is no evidence of Anne having a bad reputation or being promiscuous in France, it was Anne’s sister, Mary, who was nicknamed “The English Mare” and who the French King knew to be “una grandissima ribalda et infame sopre tutte”2, not Anne so perhaps Sander was confusing the two Boleyn girls. Whatever the case, Sander is the only person to mention a liaison between Anne and her father’s chaplain and butler so I believe that it is a case of Sander trying to blacken Anne Boleyn’s name and discredit Elizabeth I. 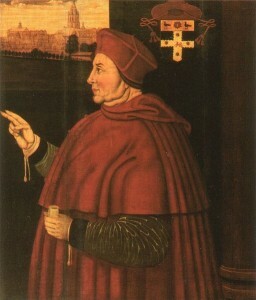 The meeting between the Cardinal and Percy ended with Wolsey saying that he would send for Percy’s father and ordering Percy to stay away from Anne. When Percy’s father, the Earl of Northumberland, arrived, he did not mince his words, calling his son “a proud, presumptuous, disdainful, and a very unthrift waster” and “wasteful prodigal”, accusing him of offending the King and threatening to disinherit him. Cavendish then writes of how, “after long debating and consultation”, it was decided that the pre-contract should be dissolved and that Percy should marry one of the Earl of Shrewsbury’s daughters (Mary Talbot). Anne Boleyn’s reaction to this news, according to Cavendish, was to be “greatly offended” and to threaten “that if it lay ever in her power, she would work the cardinal as much displeasure”. Henry Percy did indeed marry Mary Talbot, daughter of George Talbot, 4th Earl of Shrewsbury and he did inherit his father’s title on his death in 1527, but by 1530 Percy and Mary were leading separate lives. According to a letter from Chapuys to Charles V in July 1532 (in the Vienna Archives), Henry Percy had to deny, in front of the council, a pre-contract between himself and Anne Boleyn after his wife, Mary Talbot, had reported that he had told her in a quarrel that he was not really her husband because he had previously been betrothed, or legally contracted, to Anne. Mary Talbot had written of the quarrel and alleged pre-contract in a letter to her father, the Earl of Shrewsbury, asking him to tell the King, but, instead, the Duke of Norfolk was informed of the matter and he told his niece, Anne Boleyn. Anne boldly decided that it was best to confront Henry VIII with the matter and ask him to investigate it. This is when Percy was interrogated and when he denied the pre-contract, something that he repeated in May 1536 when the Archbishop of Canterbury was looking to annul the marriage of Henry VIII and Anne Boleyn5. When we read George Cavendish’s account of the relationship between Henry Percy and Anne Boleyn, we are left thinking that Henry VIII prevented their union because he was interested in Anne but this is probably not the case. Cardinal Wolsey was trying to sort out a marriage between Anne and James Butler and it was these plans which were being threatened by Percy’s “folly”. If we are to believe Philippa Gregory’s “The Other Boleyn Girl”, then Anne Boleyn purposely seduced Henry Percy so that she could become the Duchess of Northumberland and the couple consummated their betrothal, making it a legal marriage. There is no evidence that the pre-contract between Anne and Percy was ever consummated and there is certainly no evidence that Anne set out to trap Percy, it looks like the two of them simply fell in love. It is sad that these two young people were prevented from marrying, particularly when we consider Percy’s unhappy marriage to Mary Talbot and Anne’s tragic downfall, but I wonder if Anne would have been happy with a man who did not fight for her. We cannot blame Henry Percy for giving up Anne, he was threatened with disinheritance and he was told in no uncertain terms that he was offending the King, but I wonder if Anne was disappointed in him – couldn’t he have put up more of a fight? Couldn’t he have eloped with her? The man she did go on to marry certainly did fight for her and broke with his beloved Church to be with her, perhaps Henry VIII was more of a man than Percy could ever have been. The story has a tragic ending. On the 15th May 1536, Henry Percy, 6th Earl of Northumberland, was a member of the jury at the trial of his former love, Anne Boleyn. After giving his verdict of “guilty”, Percy collapsed and had to be helped out of the court, and so missed the trial of Anne’s brother, George Boleyn. Anne Boleyn was executed on the 19th May 1536 and Henry Percy died in 1537, just a year later. Anne’s legacy was her daughter, a girl who would become Queen Elizabeth I of England, but Henry Percy left no legacy. His marriage to Mary Talbot had been unhappy and childless, he had been careless with his money and on his death his estates went to the crown and his title went to his nephew, Thomas Percy, a man who was executed during the reign of Elizabeth I for his part in the Rising of the North. A sad end. The famous Tudor poet, Sir Thomas Wyatt the Elder, was also linked to Anne Boleyn in the 1520s. He had grown up at Allington Castle, Kent, not a million miles from Anne Boleyn’s childhood home at Hever, but it is at the English Court that he fell in love with Anne. Wyatt had married Elizabeth Brooke, the daughter of Lord Cobham, in 1521, but it was not a happy marriage and Wyatt’s grandson, George Wyatt, wrote of how, when Wyatt first saw Anne at court, he was “surprised by the sight thereof”6 and could not help but fall for her hook, line and sinker. Wyatt’s poems are evidence of his infatuation with Anne. His poem “What wourde is that that chaungeth not” has the answer “Anna”, he writes of “That Brunet” in “The Lover Confesseth Him in Love with Phyllis” and in “Whoso list to hunt” he tells of a man hunting a hind (Anne), with little chance of success, and then being forced to withdraw from the hunt because of another hunter (Henry VIII). As I wrote in my article “Sir Thomas Wyatt the Elder”, it appears that Wyatt’s feelings were unrequited, after all, Wyatt had little to offer Anne because he was already married. The “tabloid” Spanish Chronicle7 tells of how Wyatt visited Anne at Hever one day and how he started kissing her and touching her breast before they were disturbed by a stamping noise from upstairs, the stamping of a jealous and impatient lover whose liaison with Anne had been interrupted by Wyatt’s arrival! A story obviously meant to discredit Anne Boleyn, but its mention of Wyatt suggests that there was a link between Anne and Wyatt before her marriage to Henry VIII, although I believe that the relationship was one-sided. We also have George Wyatt’s story8. In this story, Thomas Wyatt playfully snatches a jewel from Anne and keeps it as a trophy. Some time later, he is playing bowls with the King and arguing over a shot when the King points to the wood with the finger on which he is wearing Anne’s ring and declares “Wyatt, I tell thee it is mine”. Wyatt, seeing the trophy on the King’s finger, replies “If it may like your majesty to give me leave to measure it, I hope it will be mine”, and then takes Anne’s jewel from around his neck and begins to measure the cast with its ribbon. A furious Henry VIII breaks up the game and goes in search of Anne for an explanation. Later, in May 1530, the Imperial ambassador, Eustace Chapuys, tells of how Charles Brandon, the Duke of Suffolk and Henry VIII’s great friend and brother-in-law, was banished from court after telling the King a story about Wyatt and Anne Boleyn in an effort to show the King that Anne was an unsuitable wife and consort. Suffolk’s banishment shows what Henry thought of the story and his advice, and Henry went on to marry Anne so there was obviously no evidence of an inappropriate relationship between Anne and Wyatt. 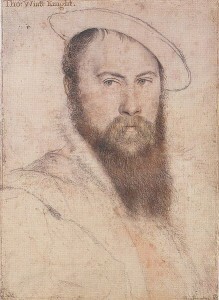 Sir Thomas Wyatt was once more linked to Anne Boleyn at her downfall in May 1536. He was arrested, examined by Thomas Cromwell and imprisoned in the Tower of London, but was eventually released in June 1536 after negotiations between his father and Cromwell. He was imprisoned again in 1541 on a charge of treason but was saved by Henry’s fifth wife, Catherine Howard. He died, a year later, on the 11th October 1542. Wyatt’s son, Thomas Wyatt the Younger, was executed in 1554 after leading a rebellion, Wyatt’s Revolt, against Mary I. Wyatt the Younger went to his death refusing to implicate the daughter of Anne Boleyn, Elizabeth, in the uprising and protesting her innocence. How fitting that the son of the man who had once loved Anne Boleyn saved her daughter from execution. So, there we have it, an account of the men linked romantically to Anne Boleyn before her marriage to Henry VIII. Although I have often heard people say that Anne Boleyn’s real love was Henry Percy, and she would have been better off marrying him, I have to disagree. Although Anne would have probably had a much longer life that way, I don’t think that Percy was her perfect match. 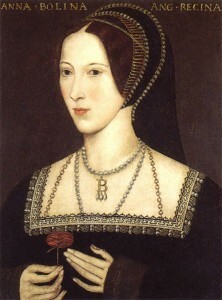 Anne Boleyn was passionate, ambitious and hot-headed, as was her husband, Henry VIII. Their marriage was a meeting of minds, a sharing of passions and a real love, in my opinion. What do you think? I’ve missed one man out here – James Butler. You can read about the arranged marriage between Butler and Anne Boleyn in my article “The Early Life of Anne Boleyn Part Five – The Boleyns and Butlers“. Thank you, Claire, for part 7!! It was really interesting. I also believe that Henry Percy was not “the one” for Anne. And who knows what would have happened if she had married him after all. I think she would have had a much quieter and simpler life, but also a more boring one than her real one. Anne was all about passion and I think the tumultuous journey of her life did worth it, as she left her mark in History and gave Elizabeth to the world. I also agree that Henry was her true match, although the end of their story was really sad, they lived some truly powerful moments together. I believe that Percy and Anne were in love but not in the same way that Anne and Henry VIII were. I don’t really like to use the word “soul-mates” but I do think that Anne was Henry VIII’s true love and that she truly loved him back. These articles on Anne have been brilliantly put together. My Tudor research didn’t really focus on Anne, and often in the original source material and in accedemic biographies of Anne’s life it is easy to miss information. However much I love Ives, these articles are the best introduction possible for anyone wanting to learn more. They manage to get every part of Anne’s early life in a detailed yet succinct way that is a must for anyone interested in her. Thank you so much, that means so much to me. I love researching Anne Boleyn and digging around in the primary sources to find the information and it is so good to know that people appreciate my hard work. Ives will always be the best though, he’s my idol! Another fascinating look at Anne’s early life! I agree that Thomas Wyatt was probably quite smitten with her and that she probably enjoyed the flirtation but was not invested. He was married and she was too involved with Henry Percy, or the memory of him. I think she did love Percy, a young, innocent sort of romance. She probably felt he was a darn good catch and she also cared for him. Would he have suited her? Perhaps. I think living way up in the north by herself with him at Court (the way a lot of wives did, I have read) she would not have been happy–she was used to and loved the glittering life at Court. And, I do think in the end, Henry won her heart. I think it took a while–after all, he had not been terribly good to her sister and he had been part of her Percy break-up. He was much older and also married. But, by the time they married, I do think she loved him–he had fought so hard for her. It really is a sad tale. Thanks! “A young, innocent sort of romance” is the perfect way to describe Anne and Percy’s relationship, Anne. I think Percy was her first love and that they were infatuated with each other but the relationship just wasn’t deep enough or strong enough to stand up to the challenges thrown at it. Anne and Henry VIII overcame huge challenges and I think that their perseverance and the way that they fought for their relationship shows just how much they did love each other. I enjoy reading everyone of them, and can’t wait for the next! Thanks, Teresa, I’ve enjoyed researching them and writing them. I do feel sorry for Percy, he was faced with losing his future, his inheritance, and also was accused of upsetting the King, but I think if I had been Anne then I would have wanted him to fight just a little bit harder for me, he didn’t mount much of a defence! I’m so glad that you’ve enjoyed the series, Jennifer. I think you are right about Henry Percy, he would have been a dull husband for Anne! Judging from the information available, I think it’s very difficult to know what Percy was like and what kind of relationship he had with his father. Maybe he really did believe the worse case scenario would happen and he went against his own feelings. There just isn’t enough information here, at least in my opinion, to know what his motives were and I would not say he did not fight for Anne – his perception and her perception of their situation might have been different, I find people difficult to predict and am not sure who Anne would have been happier with. The more I read about Anne, the more elusive she becomes and even the people around her. I can see how difficult it is to make any firm conclusions based on the available facts. I actually find the Wyatt/Anne relationship really sad… he seemed to really care for her. Part of me wonders whether part of Wyatt the Younger not protecting Elizabeth under torture is due to his father’s feelings for her mother. It makes me think of his father telling his son tales of Anne and how truly magnifincet she was. I disagree. Sometimes it is better when opposites attract. It would have been better had Percy fought for her more, but he was young and feared being disinherited. They might have eloped, but probably would have been caught and brought back. If their relationship had not been stopped, she would have brought him passion, and he would have brought her serenity. Her relationship with Henry ended so badly it is hard to believe of them as “soul mates.” There was too much hate. There is the story from Cavendish that tells us about Henry Percy and Anne, but do we know that it is reliable. Just how many people is Anne meant to have been contracted to? If all this happened after she got home in 1522 then she was a busy girl or her parents were. The Butler contract falls through and then Anne gets herself entangled with Henry Percy. It is no wonder that when it was discovered his parents were outraged. The Earls of Northumberland considered themselves to be the most powerful family in the North and one of the oldest in the country. Their line goes back donkeys years. The 5th Earl, Henry’s father was powerful and proud and did not believe the daughter of a knight, no matter how the rest of her family were connected was good enough for his son. Only the daughter of another noble family would do and that is what happened. Mary Talbot was the daughter of the Earl of Shrewsbury another old and distinguished house. And it is here that we have some back up to the story that Harry Percy and Anne had some sort of relationship. Mary and Percy did not have a happy marriage and it is clear that she wanted out. Mary Talbot cited a pre contract or betrothal between her husband and Anne Boleyn as reasons for wanting her own marriage to him terminated. Later, when Henry VIII wanted to have the marriage to Anne declared null and void before he killed her, he had Cranmer and other bishops root out a reason to find a former relationship. One was that of a pre-contract with Anne Boleyn and Harry Percy. The Earl solemnly died it by swearing on relics and the Bible before the entire council that it was not true. So did Anne and Percy have a relationship? Mary Talbot believed so, the King wanted to believe it to be true. Anne and Harry Percy are said to have promised to marry each other and were in love but according to the Cavendish Life of Wolsey Henry wanted Anne and had the relationship broken up. It was clear from this evidence that some love relationship existed, that Anne believed she was going to marry Percy and was upset when the relationship was dissolved. However, a belief of a promise to marry does not constitute a pre contract and Henry cannot have it both ways; break Anne and Percy up and then declare that they should have wed in the first place. But somehow that was just what he wanted to do. In any event it may have been better for Anne and Percy had they been allowed to marry, but it was not going to happen. His family were too powerful and too important to allow such a marriage and that was the sad fact that pushed her towards the English Court and the English throne. A tragic decision? Well, she did become Queen and she did want to become Queen, she did have a high life for several years before becoming Queen. Her life with Henry was not all bad. In fact it was good up until 1535 and it fell apart at that time. She gave birth to Elizabeth and she was happy as Queen for two years. It is only seen as a tragic life by historians with hindsight as we know that Anne was killed for trumped up charges of adultery and treason. Had Anne been blessed with a living son, things would have been quite different and her life would not have been a tragic error as she had lost her first love, but the triumph that she had always craved from the moment she and Henry became the item of the century.